My love of the auto-rickshaws as they are known in India or tuk tuks in other areas of South East Asia began on my first trip to Bangkok, Thailand back in 1999. I was 21 and fresh out of University, I had a longing to see the world and here I was, a very long way from home and travelling alone, what on earth was I thinking?! It didn’t take me long however, to slide into the back-packer scene, enjoying long lazy lunches and meandering around the delights of the market stalls on the Khao San Road. It was from this road that I took my first trip in a tuk tuk and I still remember it vividly! Growing up in the UK, where the roads and transport system is relatively organised and rule bound for our own safey, to get into a three wheeled vehicle, that I thought probably had no insurance, tax, MOT or any other safety checks in place, was pretty risky, if not darn right dangerous! So with a little trepidation, placing my life in the hands of a stranger, I climbed in and asked to be taken to the Golden Temple. Vrooom! We sped off at lightning speed, dodging cars, mopeds, bicycles and other tuk tuks weaving in, out and around everything else on the road. I’d never seen such crazy roads, dangerous driving or apparent lack of highway code, with the only rule seeming to be ‘put your foot down and honk your horn!’ But I loved it! I loved the thrill of not being entirely safe, living on the edge and absolutely enjoying every moment. There was a cacophony of sound, the motor-bike style engine, which sounded more suited to a petrol lawn mower, the squeaky, high pitched horns and the tinkling of bicycle bells. The various shouts and calls from driver to driver, with the wind blowing in my hair through the open sides of the vehicle I chuckled all the way to the temple! I even had my photo taken with the driver, standing next to his tuk tuk. My love affair had begun and having just come back from an auto rickshaw ride from Trivandrum rail station, once again, the thrill of the ride, the chaos of the roads and the excitement of not quite being sure if I’ll reach my destination in one piece is still just as thrilling. It’s an experience not to be missed for anyone travelling in India or South East Asia. Now I wonder if I could hire one to drive myself…? 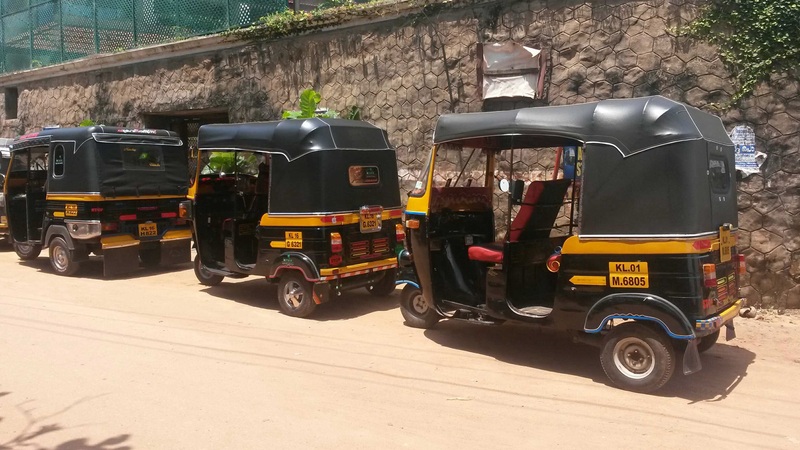 How about hijacking a tuk-tuk when the driver’s on a break…?